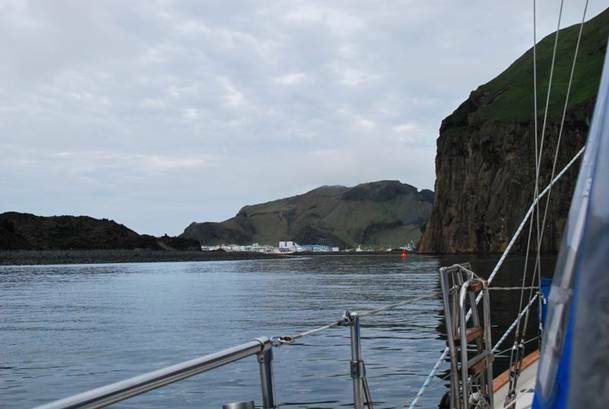 Our initial port in Iceland was the Vestmannnaeyjar Islands are off the SW coast of Iceland. Only one of the islands is inhabited (Heimaey). This island was in the news in 1973 when Eldfell, a second volcano on the island, erupted causing the evacuation of the island. Lava spewed forth threatening to cover the town and harbour. 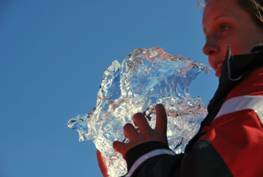 Cold seawater was poured on the volcano to control the spread of lava which threatened to close off the harbour entrance. The island increased in area by a third. The new harbour is more secure since it has protection from the SE now which it lacked before. 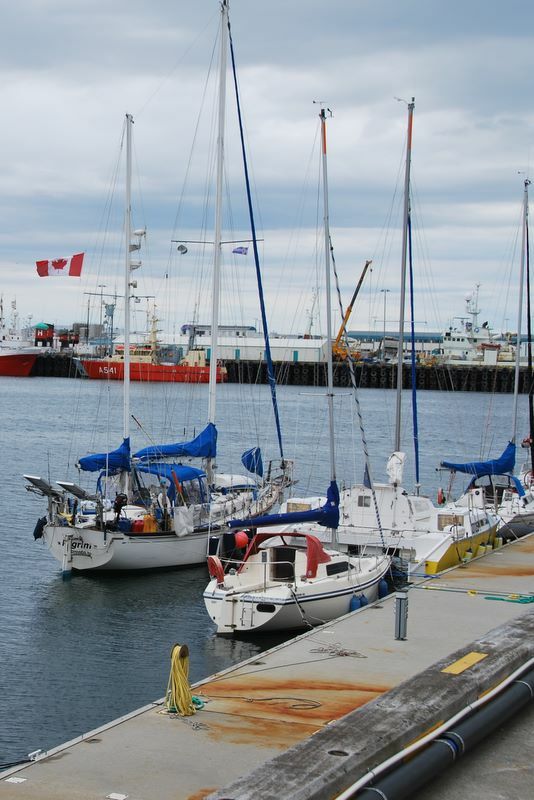 There are a few pontoons for visiting yachts with electrical hook-ups, water and no charge. 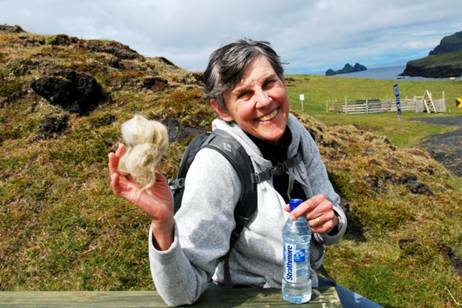 We stayed in Vestmannaeyjar for several days and hiked to the southern tip of the island (Heimaey) to see the bird cliffs. It was a fascinating walk, and just enough length and challenge to give our legs a good workout without too much stress. 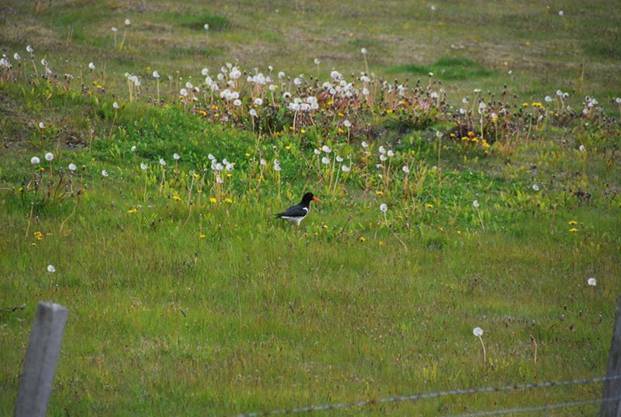 We saw four new birds: Golden Plover, White Wagtail, Redshank, and Snow Bunting. The plover and the many oystercatchers tried to scare us away from their nests; silly birds to build nests so close to the road. 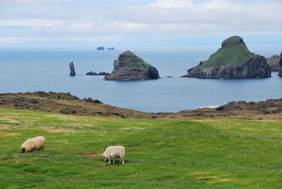 There were sheep / lambs in the fields as well as Icelandic horses. The sheep seem to be “self-shearing” in that the fleece seems to shed first from the back, then the belly, and finally the legs and clumps of wool lie on the ground. We picked up samples of white, black and light brown wool and were amazed how soft it is. However, we understand that most Icelandic sheep are sheared for their wool. The cliffs were loaded with birds: fulmars, kittiwakes, and puffins on the cliffs and eiders swimming at the base of the cliffs. 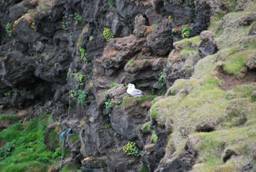 The fulmars are great flyers/soarers and kept us company the entire trip from the Faroes to Vestmannaeyjar. One interesting fact we learned about puffins. The young are called pufflings, and in August when they fledge, they are distracted by the lights in the city, become confused and land on the streets. The children recover them in cardboard boxes lined with soft towels and release then back on the shoreline. 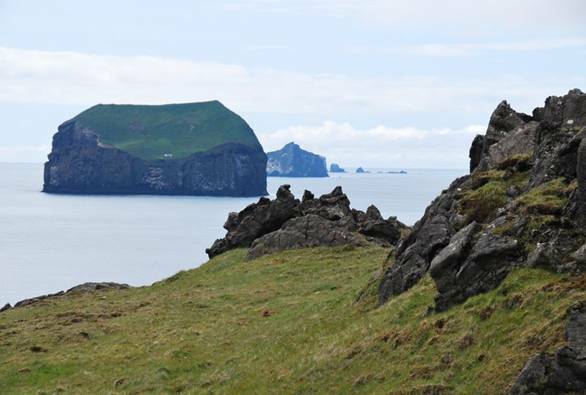 There are over 1.1 million puffins in the Vestmannaeyjar island group. 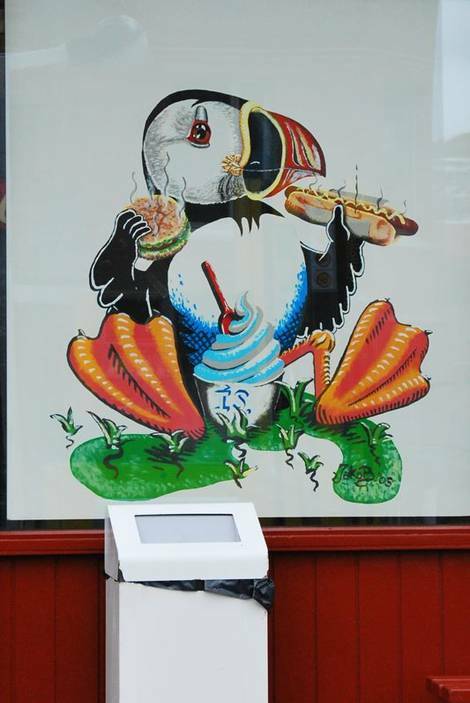 Studies show that the puffin population grows and diminishes in sync with the sand eel population, the puffins’ main food. Sand eels are in severe decline, and so are the puffins. 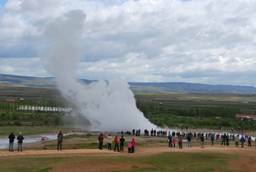 There is geothermal energy near the surface of the ground in certain parts of the island. During our walk we would suddenly feel warmth from the ground despite a cool wind and no sun. When it started to rain, steam arose from the ground. The beaches are black gritty sand. If you take a handful of sand, a black/brown residue of dust remains on your skin. There are many islands / islets that rise directly out of the sea, giving an eerie sensation. 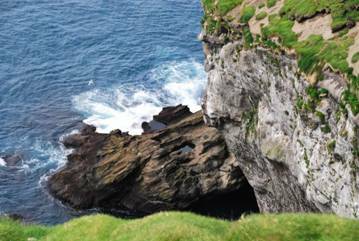 On the larger islands the cliffs appear white because of the nesting birds. There are dark areas of sand / rock on this island, but much is covered with a growth that looks like green velvet from a distance. 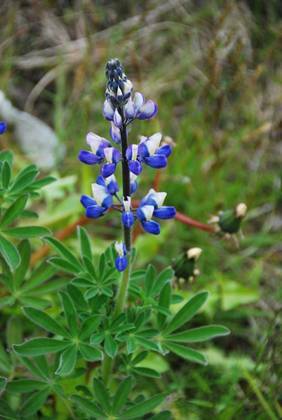 Purple lupines grow wild in prolific bunches, and alpine plants with tiny flowers cover other areas. 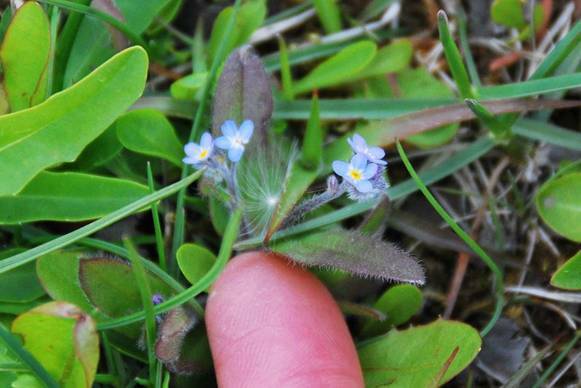 One of the flowers is very similar to a forget-me-not, but smaller. 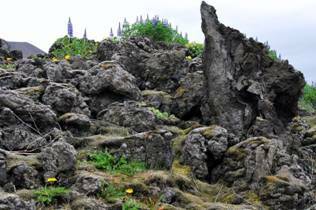 The lupines were introduced into Iceland in the 1940’s to help control soil erosion. The flowers are lovely, but the plant has become virulent and a pest, and now there are steps taken to reduce its real estate, since it has not been particularly helpful in controlling erosion. It is a member of the pea family, so has good strong roots and is a source for nitrogen in the soil, but its pestiness is stronger than its usefulness. 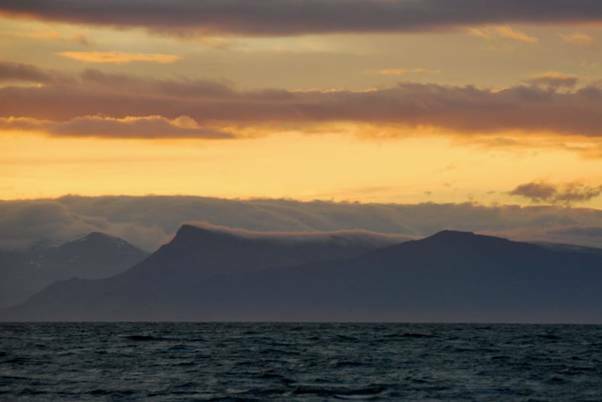 We made the trip from Vestmannaeyjar to Reykjavik (120 miles) in a 23-hour motor sail. There was little wind until we rounded the northern tip of the Reykjanes Peninsula for the 20-mile run due east to Reykjavik. Then we suddenly experienced 20 knots from the east … just our luck. We arrived in Reykjavik at 7AM. We made the mandatory call on the radio to Harbour Control. After 3 or 4 calls, we had an answer, so faint it was hardly audible. “Just go into the harbour and find a berth on the port side” was the response. When we went to the area our cruising guide indicated was open for visiting yachts, there was nothing but a pontoon for 3 tugs! No room for us. Then we saw another pontoon, but it was full of local boats. After circling and surveying for about half an hour, we finally rafted to a local home-built plywood catamaran. Thankfully there was no wind and we had all fenders and balls positioned to cushion us. A guard on the wharf saw Brian as we were attempting to find an outlet to plug in; he was clueless about charges, registration, electricity, etc. 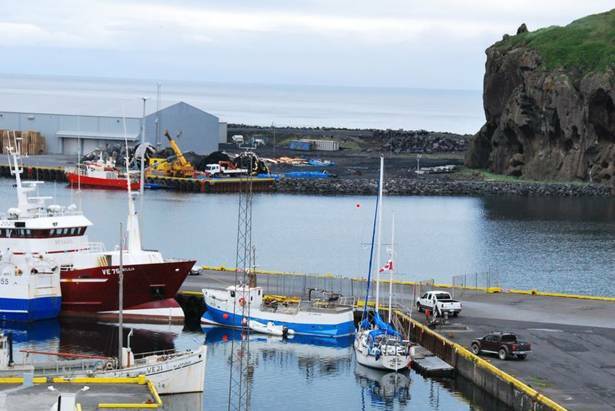 It appears that the harbour is undergoing major changes and visitors are not welcome. The visiting yachts’ pontoon has been moved and is mainly used by local yachts. There is a water hose on the pontoon, but the electrical stands have not been wired-in, so we had to rely on our wind/solar/gasoline generator(s) to keep us charged. We certainly did not find a warm welcome … more like a Viking welcome… let’s see how long they can tough it out! No facilities AND no concern from the port authorities make it a double whammy. 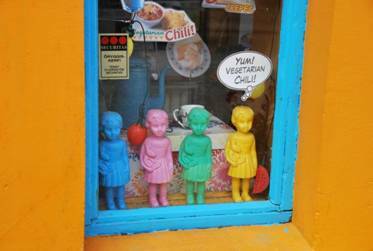 Not welcome in Reykjavik. No power, no dock space, no help from officialdom … Immigration and Customs were quick to descend but offered no help only a sharp rebuke because one of the forms provided us by an Icelandic Customs official in Vestmannaeyjar was not correctly posted in the cockpit window. After breakfast, a nap, and a bath while we still had hot water from our long motor-run (the motor heats our hot water tank), we heard children squealing and rock bands checking sound levels. 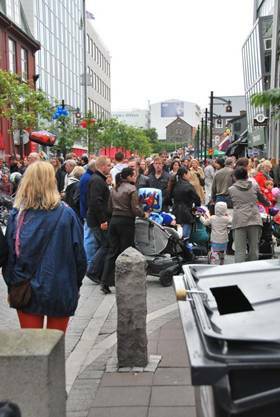 A quick check in our Icelandic tourist guides told us that June 17 is Independence Day, a national holiday and huge street celebration. We donned our backpacks and rain gear (it was threatening, but never did pour on us) and went exploring in the old town. 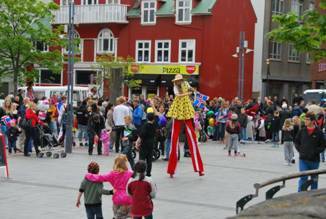 The streets were cordoned-off and full of people, including children with balloons, painted faces and fancy candy. We slowly got our land-legs and joined the crowds. 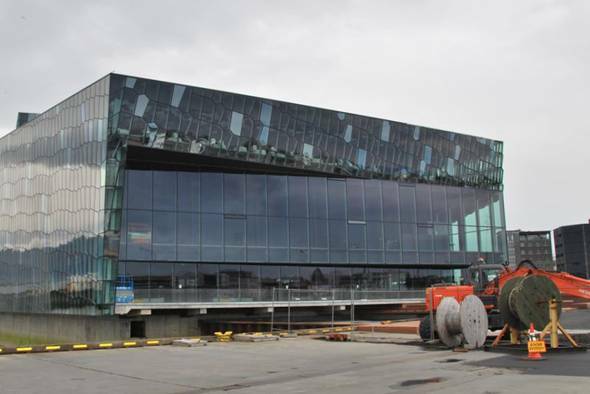 The Reykjavik harbour is undergoing huge changes. A new concert hall, Harpa, dominates the shoreline. It is glass, and looks like a honeycomb, each panel of glass reflecting different colours and textures depending on the weather. 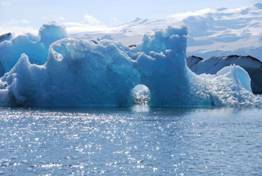 It is one of the factors that have helped bankrupt Iceland. Tours are available at a cost of $15 a head (we passed on that). The next-door convention centre is still a hole in the ground. Evidently Harpa is the reason the guest pontoons were removed. Dredging near the concert hall is underway, and perhaps in several more years, facilities for visiting yachts will return. When locals are asked about Harpa they are quick to condemn it as a total waste of time and money and an eyesore to boot. Apparently even the symphony can’t afford the rent according to locals who are in the know. The second feature of the Reykjavik skyline that makes an immediate impression is the massive Hallgrímskirkju, constructed between the 1940 and mid 1974 with a magnificent Klais organ added in 1992. More than half the cost came from the parishioners; the rest from the state. 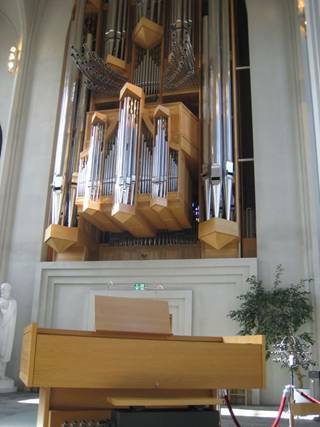 The modern cathedral is white, with clean straight lines, large clear glass windows, impressive organ pipes, and somewhat cold and uninviting. 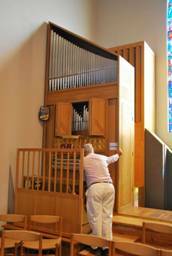 The organ concert echoed the feel of the cathedral: technically excellent, but lacking warmth. 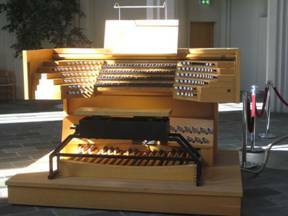 This was a very different sound that we heard in October 2009 in Lübeck at the Buxtehude International Organ Competition. 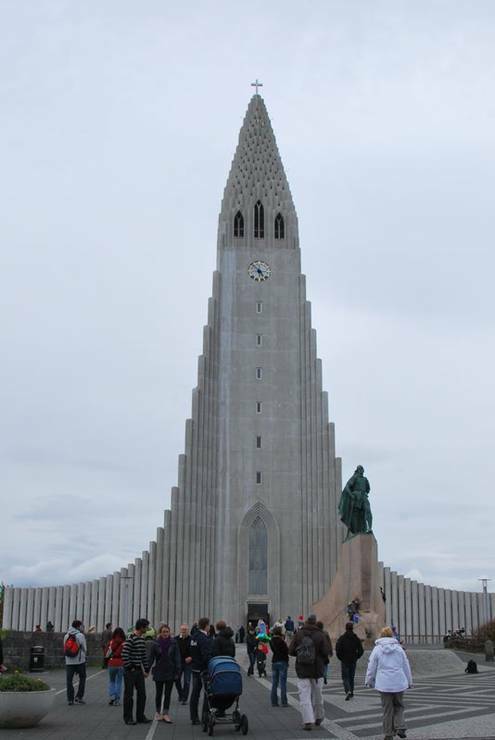 The cathedral is named after Iceland’s favorite hymn writer from the 17th century, Hallgrím Pétursson. There is an elevator in the tower that transports the tourist to a bird’s eye view of the city, the harbour, and the sea beyond. On the last Sunday each month there is an English language service, based on the Church of England, for the aging British immigrants (young ones do not attend church, it seems). 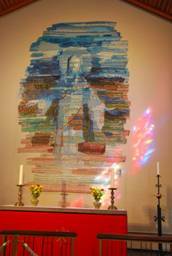 We attended the service on June 24 and found the small congregation very welcoming. The service was formal without any attempt at inclusive language. Of the four hymns, three were familiar, but rarely sung these days, at least in our Toronto church: Then sings my soul, my Savior God, to thee, What a friend we have in Jesus, and the Battle Hymn of the Republic (My eyes have seen the glory of the coming of the Lord). 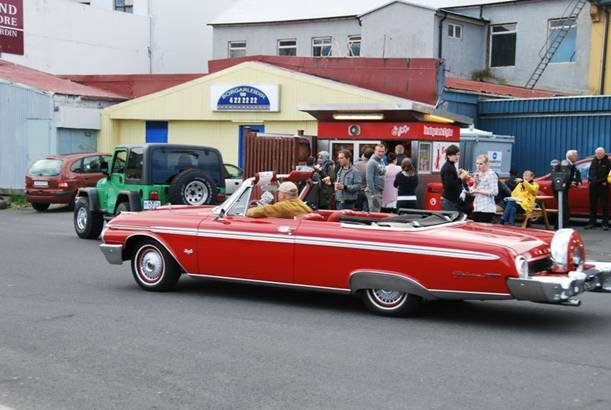 We decided to keep Pilgrim in Reykjavik and take several of the standard bus tours to see other areas of Iceland. 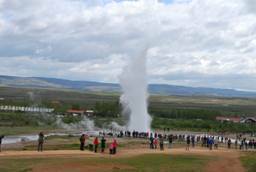 Our first tour, the Golden Circle, took us to several diverse sites near Reykjavik. 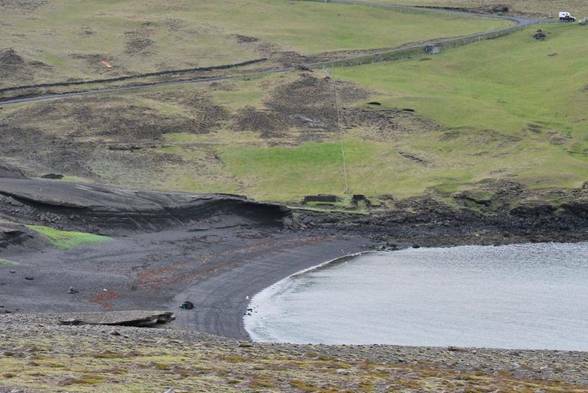 The first overlooked Nesjavellir, site of a geothermal power plant and the pipelines that provide most homes with hot water. 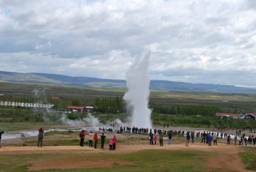 The tour guides suggest that most of the electrical power is generated through geothermal energy, but this does not seem to be true. Most power is generated through hydro-electric facilities. 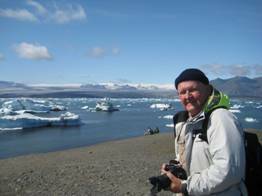 The owner / builder of the catamaran against which we are rafted works in a geothermal plant. 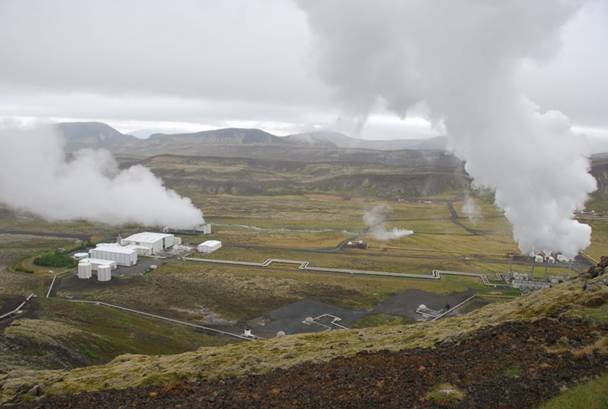 He told us that there are a number of technical issues that plague the geothermal power plants; corrosion, calcification, and in incursion of sea water at sites near the coast are problems that have not yet been fully solved. 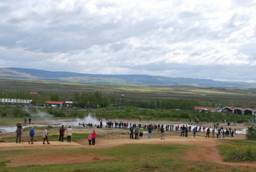 Then we went to AlÞingi, Iceland’s first parliament created in 930 AD located at near Lake Þingvellir. Originally it was an annual meeting at a central location, easy for the representative of each of the diverse tribes to attend. Today the Prime Minister’s Summer Residence and a church are the only buildings on the site. The current parliament is in Reykjavik. 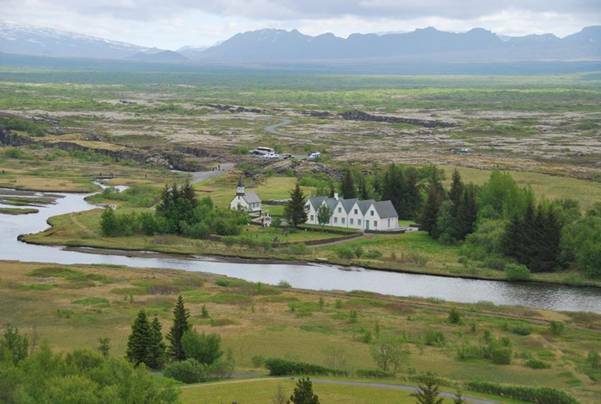 The original AlÞingi site is also on the rift between the North American and European tectonic plates. 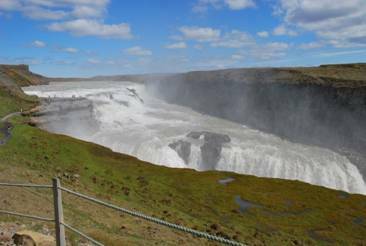 Our next stop was Gulfoss, the Golden Falls. 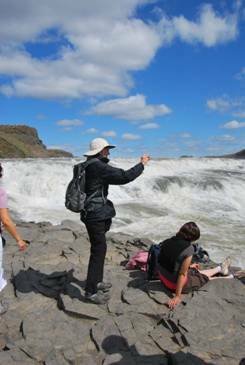 The falls are fed by a river of runoff from Langjökull glacier, so the water is milky in colour, resembling watered-down chocolate milk. The sediments in the water cause this appearance. The double falls are spectacular forming an L shape cascading into a narrow fissure. After the falls, it was the geysirs. 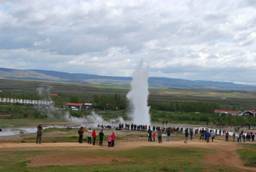 The original Geysir has ceased to gush, but Stokkur, a few feet away, is a faithful performer, erupting water and steam up to 30 meters into the air. 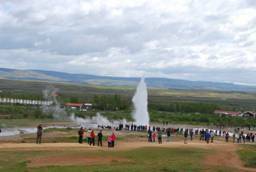 There are other hot springs and bubbling milky pools at this site. 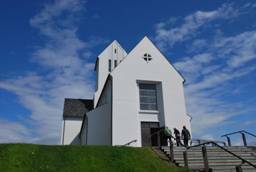 The next stop was Skáholt, the ancient seat of the Icelandic bishops, first Roman Catholic, and then Lutheran after the Reformation. The great cathedral and associated buildings were destroyed in an earthquake in the 18th century. Today there is a modern theological centre and church (built in the 1950’s) on the site, along with the foundations of the old buildings. 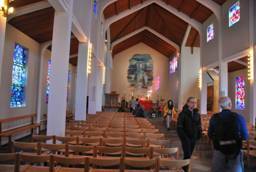 Much of the art work in the church includes references to Iceland’s Viking / pagan past. 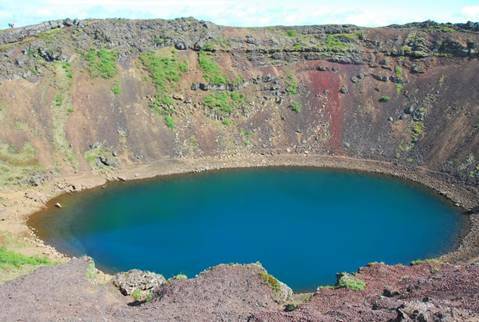 We stopped briefly at Kerið Crater with its green lake at the bottom of the crater. We drove through Hvergerði, a small village on a highly active geothermal field which provides heat for hundreds of greenhouses. Most of the locally-grown produce is from this small village. The bus tour lasted all day, and we did not get back to our drop-off point until dinner time. Rather than cook, we had a Hot Dog dinner from the stand made famous by Anthony Bourdain. We were not impressed, but we don’t think he was either. 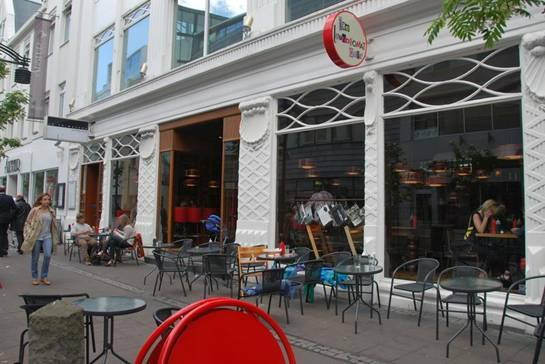 Icelanders love fast food, probably because the cost of food is so high, and all most people can afford when they eat out is (cheap) fast food. In the grocery stores we found packages in the meat counter of hamburgers complete with buns and the trimmings. Our Wednesday tour was most exciting. 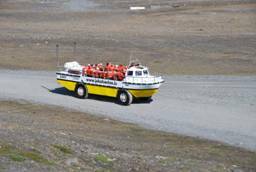 It required a 4-hour bus ride to the SE of Iceland (and another 4-hour ride back) to Vatnajökull, the largest glacier in Europe. 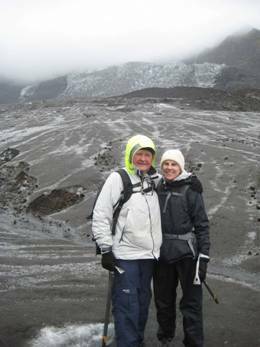 We got to walk on a glacier tongue still black with ash from the volcanic eruption a month ago with an experienced guide. 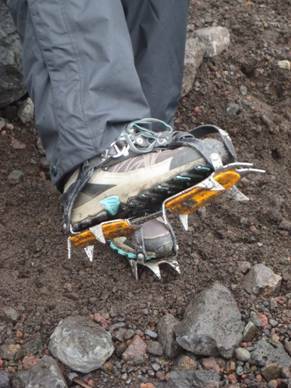 We had crampons (clamp-on ice spikes) on our shoes and a pick/walking stick to help us on the slippery surface. 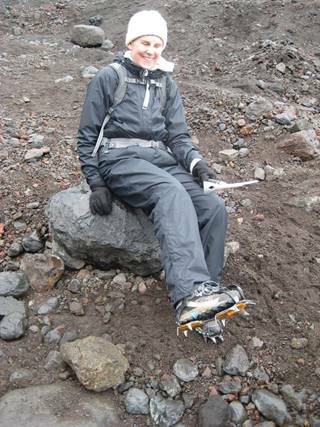 Since the ice was black, it gave us the (false) impression that the ice was not too slippery. 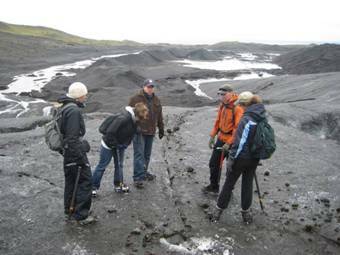 We saw large fissures in the ice and underground rivers were visible through “sinkholes” on the surface. 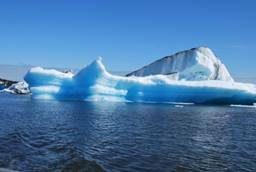 The glacial walk was followed by a boat ride on Jökulsárión Glacier Lagoon. 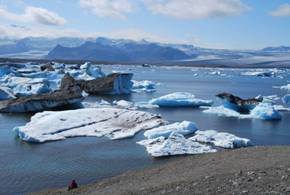 The lagoon was created in a river bed due to the recession of the Breiðamerkursandur glacial tongue over that past 20 years causing the river to widen and become a lagoon. 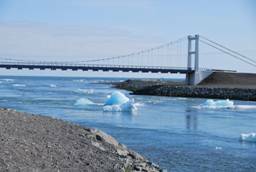 Ice breaks off the tongue creating a large number of small bergs and bergy-bits in the lagoon. Some of the ice was white with ice crystals, some clear, and some streaked with black ash. 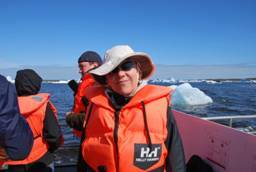 It was a fascinating trip and OK since we were not in our own boat. 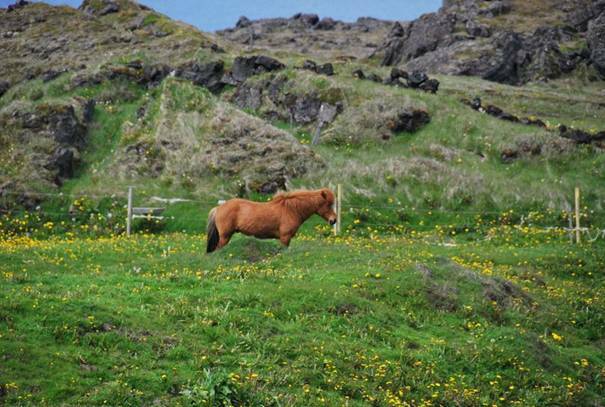 During the bus trips we saw many Icelandic horses. 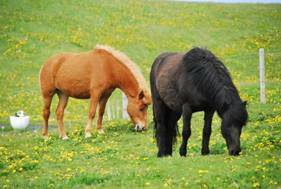 Importing horses to Iceland is banned to keep the genetic line pure. The horses are supposed to have a great disposition, are sturdy and short, and have an extra gait, the tðlt, a steady, smooth running walk. If you follow our stories, you know we love to taste local food. 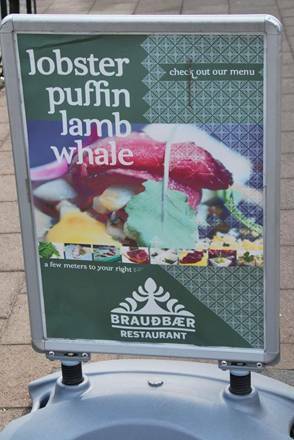 In the Faroes this was not possible since traditional food (fish, puffin, fulmar) is caught, not bought. 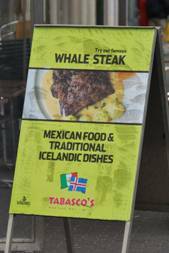 In Iceland, traditional food is available in some restaurants, but not in the markets. Therefore, we celebrated Brian’s birthday at a tapas bar that serves 7 Icelandic dishes, including smoked puffin, Minke whale, monkfish, grilled lamb, sea trout, grilled Norwegian lobster and Skyr for dessert. The puffin was tasty, but better without the blueberry sauce and the lobster delicious with a heavy garlic accent (traditional Icelandic?) 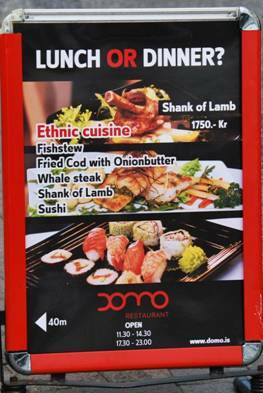 The other dishes were OK, but whale is like over marinated, over-cooked tough beefsteak, monkfish is like catfish, the lamb is tougher than Scottish lamb. The putrefied shark was thankfully not on the menu. We decided to pass on a trip to the Blue Lagoon. 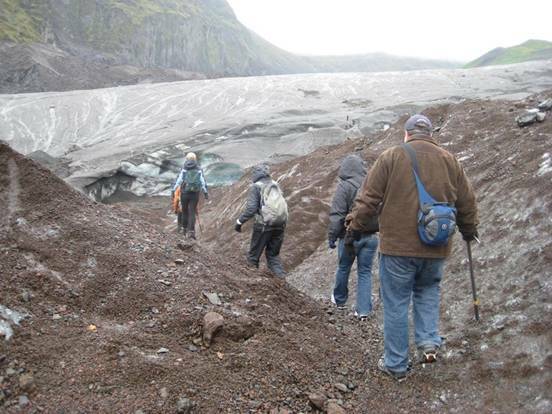 It was another expensive tourist site, and we had blown our budget on the glacier walk and dinner out. Iceland is expensive. Instead we opted to go to the indoor geothermal pool in Reykjavik. Since we did not have hot water onboard Pilgrim, it was a great treat to have a long, hot shower before going to the pool and the hot pots (Jacuzzis) kept at 42 degrees Celsius. We found a supermarket within walking distance of the harbour. There was a good selection, but we found the fresh produce somewhat lacking in variety and freshness. 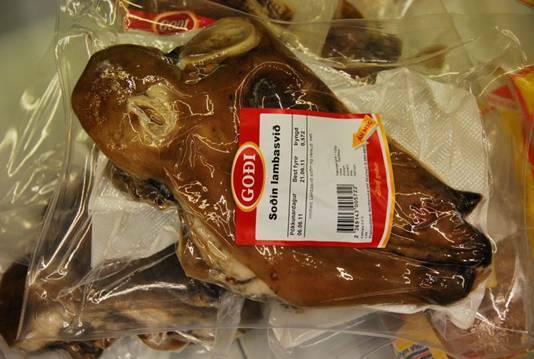 As in Norway, the Icelanders do not eat chicken leg cuts. We have no idea what happens to chicken legs, thighs and backs here, but they are not in the market, even frozen. A new café in the old town, the Laundromat Café, provided a great setting to do laundry (3 washers, 3 dryers, mostly in working condition), have breakfast or coffee, and use the Internet. The weather was sunny most of our time in Iceland, but quite cool. The tulips and daffodils were just fading, and the lilac bushes were just in the beginning stages of blooming. We decided it is time to get to warmer water.